Paul McCartney has been travelling across Canada on his "Fresh Up Tour," and the former Beatle stopped in Winnipeg to perform on Friday night (September 28). His wasn't the only festivity he attended, though, accidentally stumbling into a couple's wedding photo shoot. 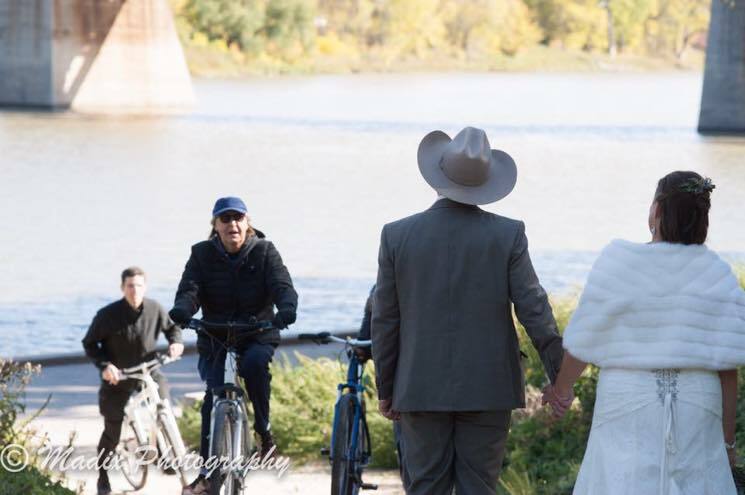 A pair of Winnipeg newlyweds were taking their wedding pictures on Saturday (September 29), and Macca and his bodyguards rode right into frame on bicycles. The singer stopped for a few shots with the couple, which will surely stand out as highlights in the album. Check out some of the pictures below, via MADIX Photography. McCartney wrapped up the Canadian leg of his tour in Edmonton last night (September 30). His latest LP Egypt Station is out now.